Salt2Summit Guide Service - With 25 + years of experience pursuing these Columbia River fish from buoy 10 to Hanford reach and up the Snake River. Fishing every tributary in between these places, I have learned certain spots and techniques used to catch more fish.In 2012 we went 49 days straight catching fish everyday. That is why I am confident enough to offer you a “catch-fish-guarantee” on full day trips. If we do not bring a fish to the boat you only pay half price or receive 50% off of the full price on your next visit. My favorite way to fish is flipping heavy cover and Beaver offers a lot of that. Flooded bushes every where. So that's what I did all day.. switching from a half ounce and one ounce weight. For probably the first hour and a half I didn't get anything..not sniffs or bites. It was dead calm and clear blue skies. Finally I pitch next to a a point of a bush and instantly get bit. Set the hook and it goes probably 1.5. it was the start of a pretty productive hour. After about 2 more smaller ones I make an awesome flip under a hanging branch and feel the tick. I set the hook and it's just weight..but I can feel the head shake so I know I got something. Just kept the line tight and let it work itself out. Finally getting a look at it and it's a big'n. After a fun fight I get it in the boat and it goes 5.05. That's why I love this kind of fishing. I ended up getting a couple more smaller ones and called it a day around 2:30. Beaver has been good to me this year. View other reports from Inexperiencedfisher. Nice report! 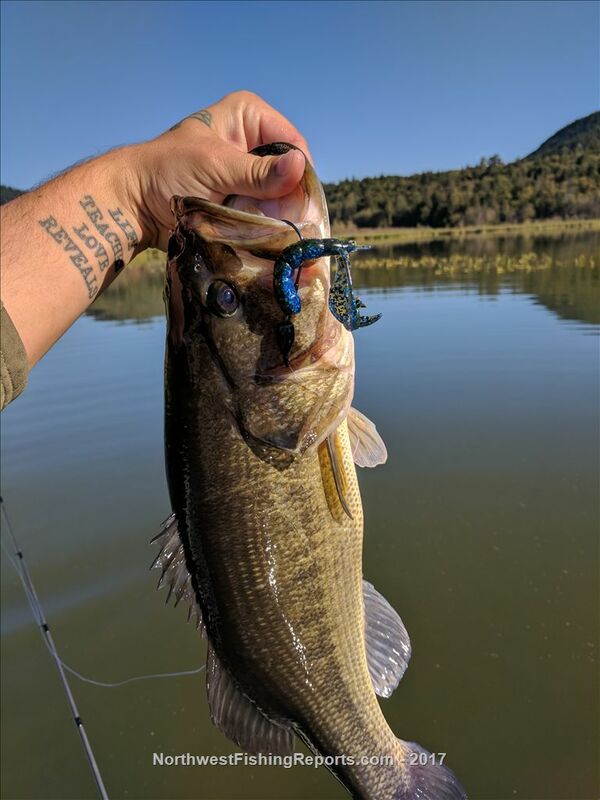 That little lake seems to host a few nice bass. I had the privilege of fishing it years ago and had a nice 21 inch, 5 pound, 11 ouncer smack a Rapala 11G on the surface. Old age, and the distance to get there, will keep me from ever fishing it again but I do like to read the reports and see the photos.